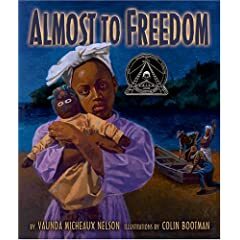 So began Nelson’s journey to use a doll to give voice to the harsh realities of slavery. Her award-winning picture book, Almost to Freedom, beautifully illustrated by Colin Bootman (Carolrhoda, 2003), does this in a powerful way. Sally, the doll of enslaved child Lindy, witnesses the hardships of the time — picking cotton in oppressive heat, feeling the pain of the lash, bearing the searing ache of loved ones being sold away. When Lindy and her mom escape for freedom along the Underground Railroad, Sally comes with them. One night, the family — reunited with Lindy’s father — has to flee a safe house to escape slave catchers and Sally is accidentally left behind. The doll, lonely at first, brings the story full circle as she becomes the fabric of hope for another child. Almost to Freedom is a rich story. Adapted into a play for St. Paul, Minnesota’s SteppingStone Theater, Nelson’s book continues to move children and adults. Author of several books for young readers, including Juneteenth (Millbrook Press, 2006), Possibles (Putnam, 1997), Beyond Mayfield (Putnam, 1999) and Mayfield Crossing (Putnam, 2002), Nelson’s latest offering is Bad News for Outlaws: The Remarkable Life of Bass Reeves, Deputy U.S. Marshal (Carolrhoda), illustrated by Tyrone Geter. It debuts November 2008. Please tell me how to purchase this script. I have been searching everywhere. I would love yo perform it for our middle school’d Black History assembly.